The Juried Student Exhibition is live in the Schick Gallery right now. 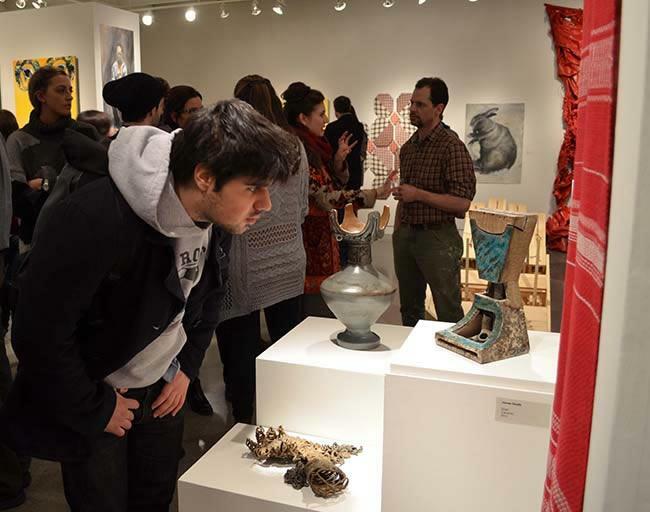 It’s the Schick’s annual juried exhibition consisting entirely of student-produced artwork. Basically what happens is Skidmore finds a well-off artist to come curate the gallery. Sanford Mirling is this year’s juror: a visiting assistant professor at Middlebury and a sculptor–a dude with an affinity for large, flowing, ballon-like pillowy structures, (according to his website) in my amateur opinion. Then students, over 250, submit their work to be included in the show. There’s no coherent theme expressed in the gallery, no guidelines for what can be submitted, it’s simply what the juror deems worthy. The utter subjectivity of the selection process has garnered some controversy amongst students and faculty, but nonetheless the gallery is impressive, versatile, and compelling. There are multiple mediums expressed: ceramic, paint, graphic design, photography, sculpture, book art, and computer audio-graphic, amongst many others. The show is not exclusive to seniors or art majors. The artist list is extensive, but just to name a few that stood out: Lea Carey ’14, Rachel Ajamie ’15, Emily Culbert ’14, Joe Klockowski ’14, Sophie Mendelson ’14, Leah Meserve ’14, Layla Durrani ’15, Winnie Vaughan ’14, Garrett Evans ’14, Gabriella Carboni ’14, Brendan Mahony ’14, and many many more. Below are some illegal photos taken at the gallery–a snippet of what’s featured, but make sure to stop by the Schick Gallery in the next couple months. The exhibit runs until March 14th, 2014.